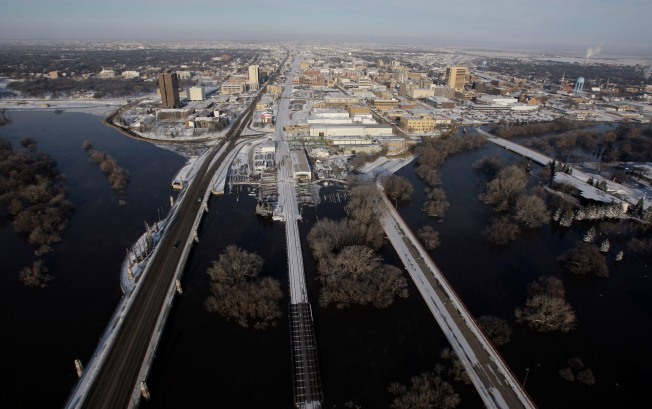 Downtown Fargo is seen at the Main Ave. bridge as the Red River continues to rise, Saturday, March 28, 2009, over Fargo, N.D.
FARGO, N.D. – The slowly receding Red River briefly breached a dike early Sunday, sending water flowing into buildings at a school campus before it was contained in the enormous effort to save the city, officials said. The extent of the damage at Oak Grove Lutheran School wasn't immediately known. The surrounding neighborhood on the city's north side was not evacuated, but residents of some areas were told to plug their sewers and monitor basements. The city had been bracing for a crest of up to 43 feet on Sunday, but instead learned Saturday that the river may already have peaked. The National Weather Service said the river crested at 12:15 a.m. Saturday at 40.82 feet. By early Sunday, the Red River had dropped to 40.25 feet, still more than 22 feet above flood stage. The river may fluctuate up to a foot and remain at dangerous levels for a week, meaning an agonizing several days before people can relax. Oak Grove Lutheran Principal Morgan Forness said city officials, the Army Corps of Engineers, and the National Guard unsuccessfully tried to contain the gushing water to one building after a permanent flood wall panel at the school buckled around 1:30 a.m.
"They made a gallant effort ... but the power of the river is just too much," he told KFGO radio. "They gave it everything they had, and it just — we couldn't contain it. It came center of campus, and now, it's inundating all of the buildings." The city said the breach was caused by erosion and started when water came up through the floor of one building and infiltrated the campus. "I think there's a little bit of divine intervention here — in the sense that we built a secondary dike to help protect the school, and that's gonna probably end up helping to protect the neighborhood," school President Bruce Messelt told KFGO. Water already has forced hundreds of residents in the Fargo area from their homes and submerged basements and yards in an untold number of houses along the river. Emergency crews in boats had to rescue about 150 people from their homes in neighboring communities in Minnesota, where about 20 percent of households in Moorhead had been urged to leave. The city requested more volunteers to resume sandbagging Sunday morning. Many were expected to turn out after church services in Fargo, a heavily Lutheran town of more than 90,000 residents. "I just hope that everybody doesn't let up. We can't let our guard down," said Al Erickson, a 47-year-old banker whose two-story home is across the street from a golf course that is now a giant water hazard. "The city as a whole will be OK, but there may be neighborhoods that still may have some trouble." National Weather Service forecasters say the river is retreating because cold weather — just 17 degrees at 7 a.m. Sunday — has been freezing water that normally would be flowing into the river. By the time that water melts, the biggest flooding threat should have passed, Hudson said. Officials in charge of the flood-response effort deployed high-tech Predator drone aircraft to survey the area, called up more National Guard troops and brought in hundreds of bags that each hold a ton of sand and could be dropped by helicopter into breaks in the levees. Volunteers also have been asked to inspect the levees for problems, joining National Guard inspection teams. The task is monumental, with more than 35 miles of levees around Fargo. "I don't think there's an inch of riverfront on the Fargo side that doesn't have some kind of levee," said city engineer Mark Bittner. "We encourage neighborhoods to get together and have their own dike patrols and assist us." Bruce Boelter walked a roughly mile-long stretch of sandbag dike to eyeball the manmade wall separating his subdivision and the Red River. Neighbor Tony Guck joined him halfway. Both had helped build the dike. The flooding was brought on by heavier-than-average winter snow, spring rain and a rapid thaw of the snowpack. A winter storm was predicted to hit North Dakota Monday or Tuesday, although the snow isn't expected to affect the flooding in Fargo. Still, wind from the storm could cause 2-foot waves that might wash over the top of dikes, said Dave Kellenbenz, a weather service meteorologist. "That's something we're going to have to watch closely as we move into next week," he said Saturday. The variation in flood forecasts was a roller coaster throughout the week for Fargo, with the projection edging upward twice before being lowered Saturday. Greg Gust, a warning coordination meteorologist for the weather service, said the predictions are complex. They come from round-the-clock work by hundreds of scientists, engineers and other experts. Some of those people brave the river for measurements of volume, flow and temperatures. They also use computer models for mathematical and statistical analyses. But even with improved forecasting methods, the river follows its own urges, and the weather service continued to hedge its prediction Saturday. The main focus now is whether the long line of levees will be able to hold up against the weight of the river water, regardless of its level. Engineers say that anytime water is pressed up against a levee for a considerable period of time, there is a risk of catastrophic flooding. "The saturation usually becomes the enemy of a levee over time," Jud Kneuvean, chief of emergency management for the U.S. Army Corps of Engineers in Kansas City. "It can cause the embankment to be less stable and slide." Word of the river's possible retreat couldn't come at a better time for 91-year-old Jim Sundahl, whose Moorhead yard had already been submerged. "I'm happy about it, I'll tell you that," Sundahl said. "But it won't do us any good for four or five days."